What would you do if your small business ran into a crisis? If you haven’t asked that question, you might be putting yourself at risk. The economy will rise and fall. That’s a fact of life and the kind of thing that can be virtually impossible to predict. You might not have a crystal ball, but that doesn’t mean that you can’t make some preparations to help you guard against the kind of crisis that could threaten your company’s existence. That’s why we recommend that all small business owners start an emergency fund. Let’s start with the basics: what is an emergency fund? You may have heard a financial advisor tell you that we should all have six months of living expenses on hand. That way, if we lose a job or encounter financial hardship, we’ll have money to pay the rent, buy groceries, and pay for utilities and gas. 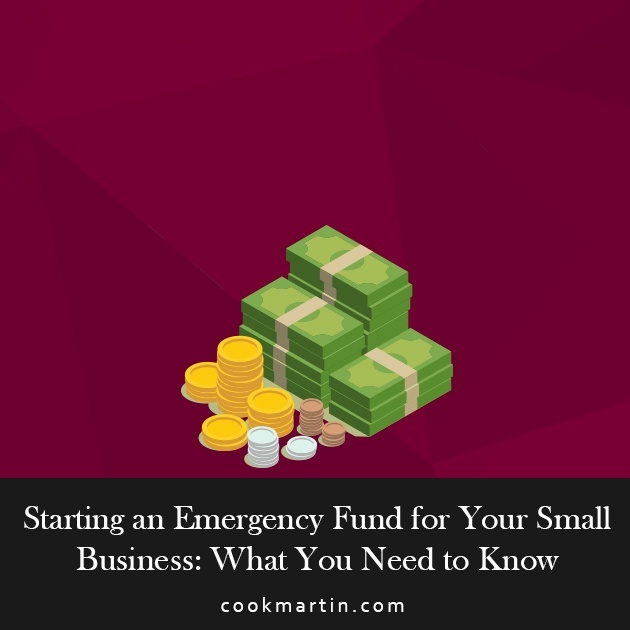 Defining an emergency fund for a small business requires a bit of tweaking. There’s no hard and fast rule for how much money you need to have on hand, but an emergency fund is a reserve of cash. It should be separate from your normal operating account. It’s there if you need it but it shouldn’t be factored into your plans unless it’s necessary. Sometimes, an emergency might not even feel like an emergency. Many small businesses run on a shoestring with a fine line between success and failure. A string of several months of lower-than-expected revenues can put your business at risk if you’re not careful. The benefit of having an emergency cash fund on hand is that it provides you with some peace of mind. Running a business isn’t easy. Even if you’re doing well and have no reason to expect that things will change, life has a way of surprising us. If you’re prepared, you won’t be caught unprepared when the unexpected happens. Carry you through slow cycles – something that’s especially important for seasonal businesses. In other words, you need an emergency fund because no matter how carefully you plan, you can’t predict everything. Every small business faces challenges. Sometimes unexpected things happen and if you don’t have a cushion of cash to fall back on, you might end up in real financial trouble as a result. That’s a hard question to answer but an important one to ask. Every business is unique and there’s no one rule that applies to everybody. Our recommendation is that you have enough liquid cash to cover between three months and one year of essential expenses. One year might seem like a lot but for some businesses, it’s a must. If you want to be able to ride out a real storm, the more cash you have on hand the better off you’ll be. You may also have incidental expenses like an entertainment fund, and it’s up to you whether you want to set extra cash aside for that. Family owned business, particularly those where both spouses work for the business, should plan on having an emergency cash fund to cover a full year of expenses. Those where one spouse has a stable job with no connection to the business are likely to be able to get by with less. Where Should You Keep Your Emergency Cash Fund? Once you’ve calculated the amount of money you need to have in your business emergency fund, the next question is where to keep it. You don’t want to put your money in any fund where you’ll be penalized for a withdrawal or possibly have to take a loss to withdraw the money. You also don’t want the fund to be volatile so that leaves the stock market out. Any one of these is an acceptable place to hold your emergency fund. The key is that you need to be able to get the money quickly if you need it, and you need to feel as certain as possible that it will be there if/when you need it. An emergency fund isn’t the place to take risks. Finally, let’s look at some tips to help you start building your emergency fund. First, make contributions to the fund immediately each month before you do anything else. This is a situation where you don’t want to mess around. Even a small monthly contribution to the fund is better than none. Second, do what you can to lower your expenses. You don’t have to take Draconian measures, but if you can trim your expenses here and there, you can put the money you save into your emergency fund. For example, you might try to buy frequently used items in bulk to get a discount or encourage power-saving measures in the office. Third, when profits are high, save extra money. You should make a minimum monthly contribution to your fund. However, if you’re in a boom time when you have tons of business, tucking away a little extra can take the pressure off in lean times. As long as you’re meeting your basic expenses and paying yourself, any extra can go into your emergency fund. If you can, try putting your money into an interest-bearing account. Even if it only earns a little bit of interest each month, over time the interest can add up. Anything you can do to encourage the growth of your fund will help you reach your goal faster than you would otherwise. Once your fund is in place, keep an eye on your monthly expenses and adjust your fund as needed. For example, if your rent increases 10%, you’ll need 10% more rent money in your fund. The key to building your fund quickly is to be consistent in making contributions and to add as much as you can during boom times. You might have to scrimp a little to get the fund in place but you’ll be grateful for the peace of mind it will give you. To get our guidance on how to turn your small business into a success, check out our business consulting services.